After several days of slow but steady decline, the euro suddenly rallied over the past couple of days, retracing most of its recent drop. Price is coming up against a very important resistance level. If it remains intact, we can pretty confidently expect a strong downtrend very soon. But if price breaks through this resistance, then chances are we may be headed to an even more complex corrective pattern. We’re updating our counts to reflect the most recent price action and to present tighter targets and invalidation points. And as usual we’ll use each count’s invalidation point as confirmation of the other count. This main count sees that the euro had been moving sideways in intermediate wave (B), which formed a contracting triangle labeled minor waves A through E.
Minor waves B, C, D and E each formed a zigzag labeled minute waves a, b and c.
Minor wave E reached exactly 61.8% the length of minor wave C, and it made a slight overshoot above the upper trend line of the triangle, which is typical. This count expects the euro to start moving towards the downside in intermediate wave (C), which will most likely form an impulse labeled minor waves 1 through 5. This will be initially confirmed by movement below 1.0812, with final confirmation below 1.0516. At 0.9832 primary wave Y would reach 100% the length of primary wave W, then at 0.9160 intermediate wave (C) would reach 61.8% the length of intermediate wave (A). This wave count is invalidated by movement above 1.1337 as minor wave 2 of intermediate wave (C) may not move beyond the start of minor wave 1. This alternate count sees that minor wave C is actually still unfolding towards the upside as a zigzag labeled minute waves a, b and c.
Within it, minute wave a formed a leading diagonal labeled subminuette waves (i) through (v). Minute wave b formed a running triangle labeled minuette waves (a) through (e). Minute wave c is likely forming an impulse labeled minuette waves (i) through (v). This count expects the euro to be moving towards the upside in minute wave c to complete minor wave C. This will be fully confirmed by movement above 1.1337. At 1.1393 minute wave c would reach 61.8% the length of minute wave a, then at 1.1600 it would reach 100% of its length. This wave count is invalidated by movement above 1.1714 as minor wave C may not move beyond the start of minor wave B. It’s also invalidated by movement below 1.1057 as minuette wave (ii) may not move beyond the start of minuette wave (i). 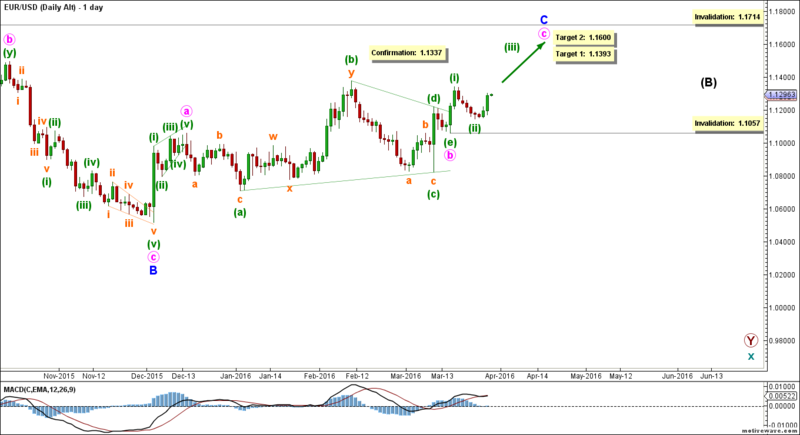 GBPUSD: Is Cable`s Consolidation Complete Yet ?! 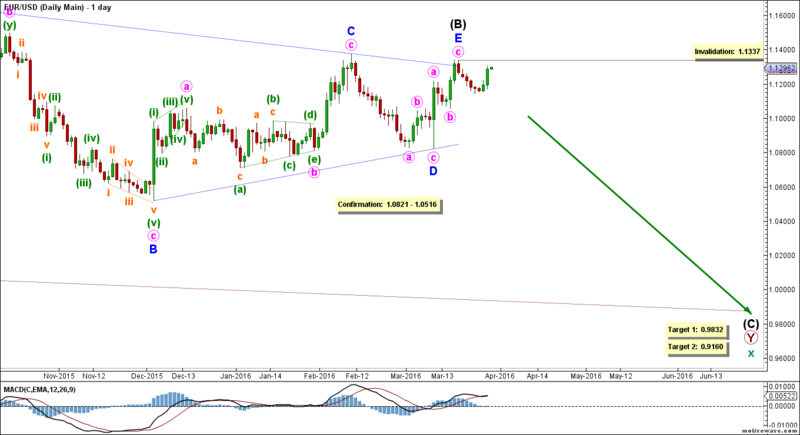 This week`s main count expects that Cable has more to offer upwards in a corrective manner to complete wave (b) green. On the other hand, the alternate count expects that wave (c) green is incomplete and that it is unfolding downwards. Elliott Wave chart analysis for the GBPUSD for 25th March, 2016. Please click on the charts below to enlarge. Before delving into the main count, we should notice that we labeled the latest downwards movement as a (a), (b) and (c) green within wave x pink. It is technically possible that the downwards leg labeled wave (a) green, can be labeled as wave i orange within wave (a) green. However, we will remain cautious and we will update that downwards movement as it unfolds. Within minor wave 2 blue, wave w pink is complete and that wave x pink has started unfolding downwards. Wave (b) green unfolded as an expanded flat correction labeled waves a, b and c orange. Wave a orange unfolding as a zigzag labeled waves A, B and C purple. Wave c orange unfolded as an impulse labeled waves 1 through 5 purple. This count expects that within wave x pink wave (a) green is complete as an impulse labeled waves i through v orange and that wave (b) green has started unfolding upwards in a corrective manner. This count would be confirmed by movement above 1.4183. At 1.4233 wave (b) green within wave x pink would reach 0.382 of wave (a) green and at 1.4285 wave (b) green would reach 50 % of wave (a) green and at 1.4339 wave (b) green would reach 0.618 of wave (a) green. This count would be invalidated by movement below 1.4057 as within wave (b) green no B wave may retrace more than 100 % of its A wave. As well this count would be invalidated by movement above 1.4515 as wave (b) green may not retrace more than 100 % of wave (a) green. The difference between both main and alternate counts is within the subdivisions of wave x pink. This count expects that waves (a) and (b) green within wave x pink are complete and that wave (c) green has started unfolding downwards. This count would be confirmed by movement below 1.4057. 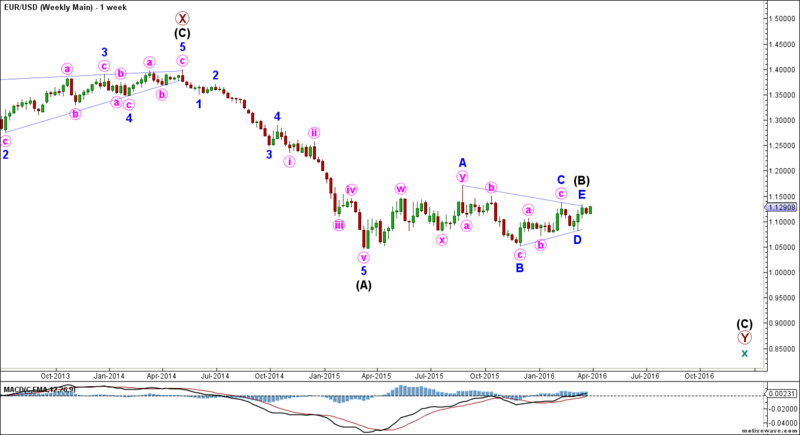 At 1.4010 wave (c) green would reach 0.382 of wave (a) green and at 1.3956 wave (c) green would reach 50 % of wave (a) green. The final target is at 1.3902 as at that level wave (c) green would reach 0.618 of wave (a) green. This count would be invalidated by movement above 1.4183 as within wave (c) green no second wave may retrace more than 100 % of its first wave and as well this count would be invalidated by movement below 1.3835 as wave (c) green may not retrace more than 100 % of wave (a) green. N.B. : It is technically possible that the sideways movement represents a triangle being underway, however it is very common to immaturely call a triangle complete therefore, we are keeping that possibility in mind which is inline with both counts.